"Thin was in" in 1959 and well into the 1960's. In 1959 Hamilton introduced the Thin-o-matic line and many of the models featured new Buren-based micro-rotor movements. Hamilton had relationships with a number of Swiss ébauche makers but Buren was special... so special, in fact, that Hamilton purchased the company in 1966. So you will find lots and lots of models from the 1960s with Buren-based Hamilton movements. One of the new models introduced in 1959 was the Thin-o-matic T-450. It was produced through 1963 - a pretty good run for model. By 1963 a Masonic dial was also offered. It's interesting to note the price also dropped a little. How often does that happen? As you might guess, the T-450 has a 10K gold filled case with a stainless steel back. The 4 and 5 digits reflect that aspect. 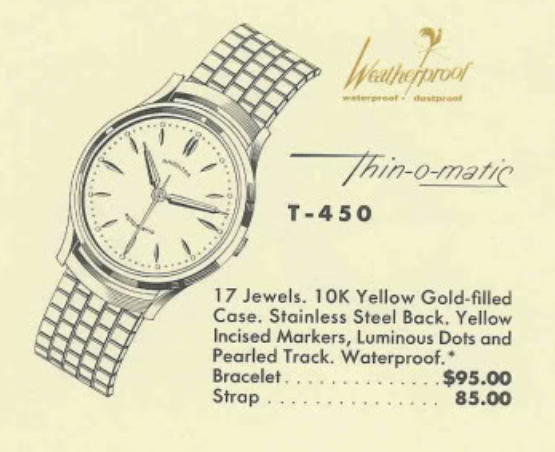 The 0 means it was the first Thin-o-matic with a 10K gold filled case with stainless back. Another model, the T-451 would be introduced the next year. I haven't really figured how how Hamilton chose which movements to use in models. Their catalogs don't really get into the specific grades used. So I don't know if the T-450 used the same Buren grade for all five years of production. My project watch came courtesy of a collector in Canada. I've seen the T-450 for sale before but never successfully landed one, so it was good to have an opportunity to see one first hand. As received, it was in fairly good overall condition and running. The crystal was a little beat up but that's easily replaced. The stainless steel case back is flat all the way across - a sure sign there's a micro-rotor movement inside. This type of back design is usually easy to open and it doesn't look like anyone has buggered it up in the past. You can see why this is called a Thin-o-matic... it's definitely a very thin watch. Inside a Hamilton 666 movement... the number of the beast. That's fitting, as taking apart these movements and then reassembling them can be a real chore. It's been a while since this watch has been cleaned but it doesn't look too bad. Apparently the oscillating weight has been rubbing the inside of the case back. I see a couple of watchmaker's marks inside so this watch has been serviced at least a couple of times in it's almost 60 years of existence. The dial has a faint radium burn from the hour hand staying at 3:15 for many years, I bet. There's also a little dent in the dial from a past watchmaker's hand removal tool. The dial-side of the main plate looks good - just a little dirty. The large red jewel supports an axle-less wheel that moves side-to-side and allows the watch to wind regardless of the direction the rotor turns. Boy there are a lot of parts in a micro-rotor movement. I haven't done a calendar micro-rotor yet. I can't say I'm looking forward to it either. That could add another 50% to the overall parts count. The movement is now bright and shiny and ticking away with good motion. It's running a little fast but nothing that a slight tweak to the regulator won't address. There... that's not to shabby. The amplitude is a little low but I haven't fully wound the watch yet. A new crystal will be a great improvement. 30.3mm should do the trick. If you compare this movement shot to the one above, I think you'll agree that this movement is much brighter now that it's been cleaned. I relumed the dial and hands so there's no more risk of radium burning the dial. A fresh crystal and new alligator strap complete the restoration. This watch looks as good as it runs. Nice. I have one of theses that needs restoring. It belong to my grandfather. What does it cost for you to restore my watch? Any competent watchmaker can handle this watch. Email me if you'd like a recommendation or two. Hello, I hope you can help a bit. I acquired an identical thin-o-matic t-450. It runs fantastically and the micro rotor winds it up very well. Unfortunately the stem does not wind it. It sets the time in position 2 like it should but in position one no ratchetting occurs. I opened the case and when I turn the stem the crown wheel turns like it should. When I turn the stem one way the two little gears that look like they should turn the ratchet wheel turn and the larger of the two disengages from the ratchet wheel. When I turn the stem in the opposite direction the wheels re-engage with the ratchet wheel but stop turning as soon as the gears are engaged. I can still turn the crown wheel but the gears on top don't turn. I disconnected that bridge and took a look underneath. Everything seems to be in place. Any thoughts? The larger wheel that engages the ratchet wheel is spring loaded. Sounds to me like it’s not moving the way it should. Maybe it needs to be cleaned and lubricated. If it hasn’t been overhauled in the last five years, it’s probably time. Thanks, I'll take a look. I did manage to pick up a similar parts movement with that bridge in working order. I'll try swapping it over to get the t-450 running right and then see if I can take the non working bridge apart and get it back to life. If I figure it out Ill need to obtain a micro-rotor to get the other movement going as well. Any ideas where I can find one? It would be the one that fits the 666 and 620 movements (I believe they should match). Fantastic job ! it looks amazing!